Compact, durable, easy-to-clean silicone pour-over coffee drip brewer holds your paper cone filter and delivers a delicious, home-brewed cup of coffee, on the go. Simply fill the Sili-Dripper with your favorite coffee grinds using a #2 paper coffee filter, place it on top of your coffee mug and pour boiling water over the grinds. Brews coffee as you pour slowly over the grinds, let it drip for a minute or two after to get full coffee flavor extraction. Brew at home, in the office, camping, RVing or while parasailing (Brewing coffee while parasailing is not recommended for safety reasons). Don’t forget to leave a short review after you’ve enjoyed your first tasty cup! If you’re dissatisfied for any reason, we’re happy to give you a full refund. 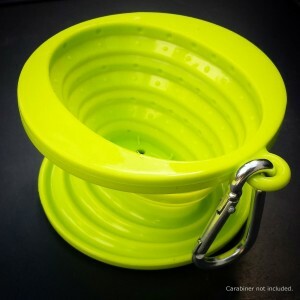 Collapsible cone saves space for drawer or backpack storage makes it easy to bring camping (or glamping), or store at the office. Gives you the ability to brew delicious, home-made, drip brew coffee without expensive equipment. Easily brew a single-cup o’ joe while sitting beside the campfire. Brew pour-over coffee just like the finest coffee houses.